A cat's tongue is truly an amazing organ. In fact, it's like a feline Swiss army knife that can be used for multiple purposes. If you've never taken time to contemplate your cat's tongue before, you have to find out what you've been missing. If you've ever been licked by a cat, you can't help noticing the sandpaper-like texture. The reason the tongue is so rough is that it's covered in tiny barbs called filiform papillae which are made from keratin, the same material fingernails are made from. These barbs face toward the cat's throat and help push food in that direction for swallowing. Cats also use these barbs to scrape meat from bones when they eat. The tongue's rough texture is perfect for grooming. As the cat licks, loose hairs and other debris are caught on the barbs and removed from the coat. However, this can also lead to the formation of hairballs if you don't brush your pet often enough. Since the loose hairs are gathered by the barbs and directed toward the throat, the cat winds up swallowing the hairs. They collect in the stomach and form undigestible masses that can lead to blockages if the cat doesn't cough them back up. 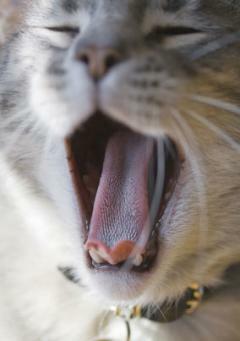 A cat's tongue isn't very good at discerning flavors because it doesn't have many tastebuds. In fact, it's largely insensitive to salt and sugar. 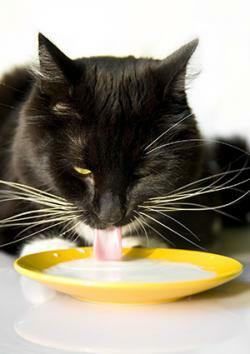 Instead, cats seem to be attracted to the texture of particular foods on their tongues. Cats aren't fond of extremes, especially when it comes to their food. Overall, they tend to prefer foods at room temperature, and they use their tongues to test whether food is too hot, too cold, or just right. 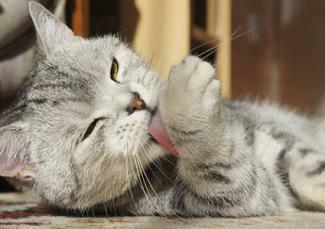 Cats actually use their tongues to cool off by grooming themselves. As they lick, the moisture left on the fur produces an evaporative cooling effect similar to sweating in humans. One of the most amazing facts of all is how cats use their tongues to drink. Unlike dogs that tend to slop water all over when they drink, cats are dainty drinkers because of the way they use their tongues. A cat simply touches the tip of her tongue to the surface of the water and then quickly pulls it back up. This creates a column of water that the cat quickly closes her mouth around to trap the water inside just before it would naturally succumb to gravity and fall back into the dish. Since a cat laps about four times per second, this works out to a rate somewhere between four and five teaspoons of liquid consumed per second. Of all the things cats use their tongues for, showing affection is the one that has the most positive effect on their owners. Kittens learn about licking from their mamas who lick them as they care for them. When your cat licks you, she's showing you she cares for you, and this is a generous expression since many felines tend to be somewhat aloof. Remember that and realize how lucky you are the next time you feel that rough tongue bathing the back of your hand.